SOLD MANY OF THESE IN THE PAST! Marlene, I asked a question on Facebook, but maybe you didn’t see it. Do you by any chance have the pattern for the potholders that are the same design as this Christmas afghan? 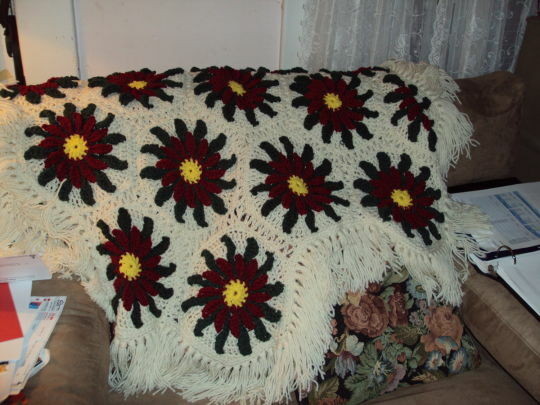 I made this afghan for my Mother many years ago, cannot remember what magazine had the pattern, then the next year they published the potholder pattern, but I lost that one and would like to make once again, it was 2 motifs put together with the pointsetta on one side and a plain motif for the back, can you help???? Sorry just saw this . I would have to look but i think it would not be to hard to make one for the back. I didn;t see your post on face book sorry!!! Marlene Piper Plichta is my face book page.